I’ve mentioned a couple of times here at Film Grimoire that I have a partner named Adam who is a James Bond superfan. He first started watching the Bond films at the tender age of 7, but became obsessed with the series at age 11. He’s such a superfan that he’s participated on a James Bond forum for approximately 12 years, almost 13; and in doing so, has had the opportunity to interview a lot of actors and people involved behind the scenes in the franchise. So it goes without saying that a) he has a lot of opinions about anything Bond-related, and b) that he certainly had a lot of opinions about Bond’s most recent outing, Spectre (2015). He saw Spectre five times in five days. I knew I had to get him to write a piece on the film for me to post on his behalf, and here it is! So Spectre, the 24th James Bond. I must preface this filmic rant with the fact that I am a massive James Bond fan. “Well, I’m glad we got that out of the way”. I’ve read reviews around the traps that diss Spectre and to be honest it seems to be in vogue amongst some critics, particularly in Australia and the US. Interestingly, the large number of reviews in the UK were overwhelmingly positive. I suspect this is because the UK understands what Bond means and is. This is a series that is ostensibly escapist fantasy. Bond films are generally dark, witty action/spy films. I’m not exactly sure what critics in Australia or the US were expecting from Spectre. They seemed very capable of heaping praise on the plot-holey Skyfall, a film more about M than the protagonist of the actual film, but then they criticise a film that is actually driven by its central character and whose plot is entwined with its protagonist’s backstory. I’m not sure what more this film could do. It has a director who is on the top of his game, his shot-making is on point and executed to perfection by BAFTA-nominated cinematographer Hoyte van Hoytema. A Bond who is focused and determined, and embodies the role more than ever, but because some critics feel they have to clamber to be heard in the saturated critical space, they sprout controversial one-line rubbish like ‘Bored, James Bored’, whilst nothing could be further from the truth. Anyway, let’s discuss what was great about Craig’s fourth Bond. I’ve now seen the film five times in five days and the same delight and excitement that I derived from it during the advanced screening remains. This is a classic Bond film. The quintessential cinematic villain? Check. The silent, physically imposing, but clearly psychotic henchman? Check. The beautiful woman and in the case of my feminist views and 21st century Bond, a strong, intelligent and empowered Bond girl? Check. Breathtaking action set pieces? Check. Outrageous production design? Check (special mention has to go to Dennis Gassner for his stunning work on Blofeld’s crater lair, a nod to 1967’s You Only Live Twice). In truth, about the only thing missing from the classic Bond winning formula is a memorable Bond song, although I’ll admit Sam Smith’s ‘Writing’s On The Wall’ does grow on you. It works very well in combination with the title sequence from visionary genius Daniel Kleinman, as well as during various instrumental leitmotifs scored by the much improved Thomas Newman. Plotwise, Spectre really is a return to the 1960’s, but with a modern twist. The surveillance subplot is a resonant and very inspired-by-real-events story, while Bond’s A-story very much draws on the beats of the classic Bond literary formula and indeed the earlier films. Highlights for me included the dazzlingly staged and shot pre-title sequence during Mexico City’s Day of the Dead Festival; the incredibly creepy SPECTRE meeting in Rome, followed by the immediately iconic car chase; the brutally violent train car fight; and the fantastically surreal torture sequence, along with the fist-pumping reveal. 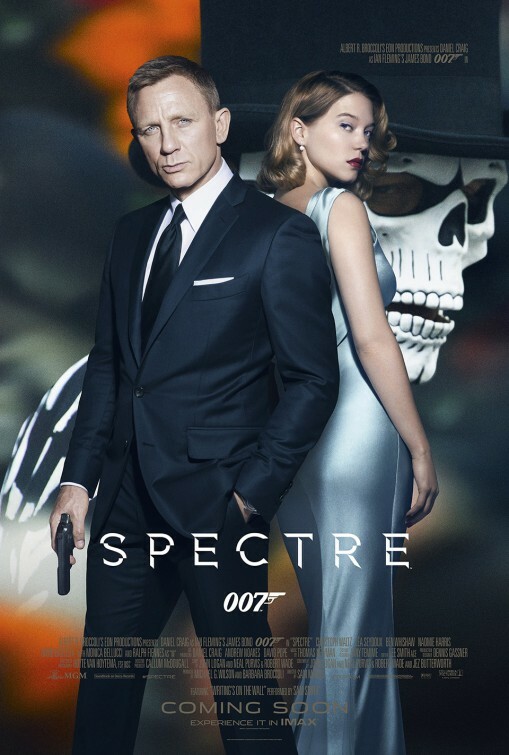 Alright, Spectre isn’t perfect. I would have preferred that Skyfall’s villain Silva was not linked with SPECTRE. Not only was his character a cheap knock-off of GoldenEye’s Alec Trevelyan and Donald Pleasence’s Ernst Stavro Blofeld from You Only Live Twice, I never bought his ridiculous plot-holey plan; yet interestingly, Skyfall received near-universal critical praise. What does that say about listening to the critics? Anyway, that’s a nice tangent. If they were going to link Silva, this should have been seeded during the scene in Skyfall where Silva explains that he chooses his own missions. It would have been very doable. Another element of the film that has come under a bit of scrutiny is the relationship between Bond and Dr Madelyn Swann (played by the irresistibly brilliant Lea Seydoux). Now there’s a couple of things to be said about this. During Bond’s torture at the hands of Christoph Waltz’ Blofeld, a scene lifted from Sir Kingsley Amis’ first continuational Bond novel (which makes me just a little bit nerdy and excited), Swann says ‘I love you’. The conditions under which this line is delivered are important to note. She has spent the last few days running from various people intent on killing her. Bond has stopped them at each turn. She’s no doubt psychologically exhausted and in a state of panic and desperation, she provides what she hopes will be a kiss of life of sorts. This is the way I interpret it anyway. It is never explicitly stated again after the heat of this moment. This enables Bond and Swann to properly engage in a relationship off screen, post-Spectre, before Bond 25 plays out the remaining arc in its homage to fan-favourite On Her Majesty’s Secret Service – many of that story’s beats having been played out in Spectre already. However, if it was their intention to craft a proper love story (i.e. Tracy and Bond in On Her Majesty’s Secret Service or Vesper and Bond in Casino Royale), they needed to spend more time together. They simply didn’t due to the constraints of the Blofeld story. Finally, it’s clear that Sam Mendes likes his villains to harbour a personal connection with our heroes. Silva with M and now Blofeld with Bond. This element, as a Bond purist, I should probably hate. The Blofeld of the books and the original five Connery/Lazenby films had absolutely no connection to Bond whatsoever, however, one must accept that this is a re-imagining of the Bond universe. For starters, this cinematic Bond was born in the 1980s, rather than the 1920s. So for this reason, I’m quite happy to afford a certain leniency to the rebooted franchise, as long as some of the basics remain in tact, such as Blofeld’s Persian kitty, his facial scar and his maimed legs. Imperfections, indeed! For a Bond fan, the return of SPECTRE and Bond’s arch-nemesis Ernst Stavro Blofeld is as good as it gets. Having two-time Oscar winner Christoph Waltz playing the super villain only makes things more exciting. And you’d be foolish to think Waltz is only contracted for one film. Craig will return to fulfill his contract for a fifth Bond film and no doubt come up against the Austrian again. Spectre brings all the key Bondian elements together and completes the arc that explains how Craig’s Bond became Bond. We’ve had him ascend from a mere field agent, to Double O status, and finally to an experienced, cynical and hardened blunt instrument. Along the way, we’ve met re-imagined Bond staples in Moneypenny, Q, the return to a male M, and now the return of the shadowy S.P.E.C.T.R.E organisation. And with Spectre in particular, the sense of adventure, swagger and true escapism, which is what drew me to the Bond novels and films in the first place, has truly been reinstated. On top of all of this, the rebooted series (the Craig era) has been lead by a master team of filmmakers, from directors like Sam Mendes and Marc Forster, to DOPs like Roger Deakins and Hoyte van Hoytema. Combine this with Oscar-winning actors regularly appearing in supporting roles and a Bond who can actually act (sorry, Pierce), and the future of the longest running franchise in cinematic history is bright. Even when Craig moves on after the next film, the Bond franchise, helmed by the amazing Michael G Wilson and Barbara Broccoli will be in great hands. This is a team that has proved it can deliver consistent commercial success and assemble teams that create Bond films that resonate with a wider audience than any of their Hollywood competitors. But in the meantime, we still have Craig’s last Bond offering to look forward to. Given what has been set up in Spectre, I for one cannot wait to see Blofeld’s return in Bond 25. That was interesting to read and I guess you are going to get a lot of comments of people disagreeing with you. Personally my expecations of a Bond movie have become different since Daniel Craig started doing the role. More realistic (Bourne like) and this movie to me stepped away from it, which simply didn’t work for me. Bond is enduring. Bourne isn’t. Already we’ve seen the steep decline of that franchise. I think what we’ll find with the next Bond film is that Michael G Wilson and Barbara Broccoli will make an adjustment in search of critical acclaim again. Bond 25 will smash it out of the park. There’s been a trend in the Bond franchise that whenever a film is critically so-so, they readjust with the next one. Skyfall was a good example. I guess for me, despite liking Skyfall (in spite of its major plot holes), I much prefer watching Quantum of Solace or Spectre. There’s a lot more of that fantasy and violence that was present in the earlier films in those two offerings. I will have to come back and read this after I have seen the film next week! While we don’t agree I can appreciate the comments of a true Bond fan enjoying a Bond film for what it is. I loved it. I’m a Bond fan as well and I thought it was pretty good. Maybe not as good as Skyfall let’s say, but still a very entertaining film. Skyfall was pretty amazing. I’m still not sure which one I like more! Heh. I think I just wrote the complete opposite post. But love hearing it from you! I’ve found the varied response Spectre has created to be quite interesting. I think the national boundaries (as it were) are very much in force, and I wonder if the non-British reviews were written primarily in reaction to the British ones. As they had to follow a week or more later due to the release dates, I think “clambering to be heard in the saturated critical space” is definitely a factor. Personally, as another life-long Bond fan, I enjoyed a lot of it but felt the finale was the worst part. It struck me as a muddle, with too much focus on the ‘MI6 gang’ sat around in C’s office. There were behind-the-scenes woes with that part of the film, of course, but I would’ve liked a greater focus on Bond vs. Blofeld, or maybe a climax more in the style of You Only Live Twice. Anyway, I’m hoping I’ll find that section more palatable when I next watch it. Yeah, obviously, with the signing of a big-name actor to M, the writers are forced to come up with tedious subplots for Fiennes to untangle. It was the same with Judi Dench’s M. It’s why I prefer Bernard Lee and Robert Brown’s M’s. They deliver messages and reel Bond in from time to time and that’s all. In the new films, the M’s need their own stories to justify the expense of hiring them. It’s why Skyfall became a Bond film more about M v Silva, than it was about Bond v villain. Even The World Is Not Enough managed to balance the M v villain stuff better than Skyfall. For me, the ending was a 21st century version of the YOLT ending. Less gunplay, but Bond v Blofeld and Blofeld always playing games. It’s textbook Bond. And there is a balance to be struck, one that I think Casino Royale hit perfectly. A Bond film can take itself seriously and at the same time poke fun at itself. This is where Spectre sits for me, except with more swagger than CR. I think the difference between Dench and Fiennes’ Ms is that they first cast Dench, then realised just how good she was, so started giving her bigger storylines. For me, they largely made that work: in Skyfall, even though it’s about M vs Silva, Bond functions as her defender and/or her weapon in that fight, so he’s still in the thick of it. In Spectre, I thought M’s story felt a little more disconnected from what Bond was up to, and given too much focus at the wrong time. I see your point about the similarities to YOLT. It felt like there was not enough of Bond and Blofeld face to face and too much of Bond running around an empty MI6, but at that point I was also miffed that they kept cutting to M and C, so, as I said, maybe I’ll enjoy it more next time. That said, I think I would’ve liked it more if they’d found a way to have the climax at Blofeld’s base, rather than trek back to London. I guess that’s just personal taste, because it wouldn’t change the fundamentals of the interaction. I’d agree with your comment about upping Judi Dench’s involvement once they realised how good she was. And once she’d warmed into the role and the audiences had warmed to her. In GE and TND she does very little. TWINE was really the film where they upped her screen time and importance. I guess, again, she had less screen time in DAD, but more than in GE. I can see that disconnectedness. It’s not ideal, is it? On first viewing, I thought they’d end it at Blofeld’s lair and he’d get the scar there, but at least I understood when they moved it back to London. It’s all this bloody Fiennes rubbish. I love him as an actor, I just wish he’d accepted Eon’s offer to play Blofeld. I hope he’s not in the role for long or they pull back his screen time. I was quite happy with only a little bit of face to face between them. We got a memorable torture sequence, IMO and they’ll no doubt have another meeting or two in the next film. Yeah, Fiennes is/can be a decent M, they just need to keep him in appropriately-sized doses. Good review Anna. Though it wasn’t an amazing movie, it was still a fine enough piece that made me happy to see Bond on the screen again. Thanks Dan! It always feels special to see a Bond film in a cinema, no matter what. Fascinating read. I enjoyed Spectre a lot too, and find myself nodding along in agreement as you reel off the various plus points. Hopefully Craig does stay for a fifth outing! Thanks Adam! I hope Craig stays too, I really do enjoy his interpretation of Bond. Loved this response to the film. Thanks heaps Vinnie, glad you enjoyed! This is a fantastic article. I will absolutely be wiling to buy this and add it to my collection. I think the backlash against Spectre has gotten a bit out of hand, and I have to say a good deal of that has to do with people expecting Skyfall II. Not really fair at all, although, on the other hand, I can see why a majority of people — probably those who have been high on 007 since Craig took over — would want that experience again. Visually and action-set-speaking, this film’s direct predecessor is a hard one to beat. But you’re right on the plot holes Skyfall had. We also share a bit of annoyance over the fact Spectre linked Silva into the organization here. He operated as a rogue agent, which I thought was one of the greatest and craziest elements of Skyfall. Lots of food for thought here.